Not only is arctic air cold, it is also wicked dry. Get those humidifiers loaded with water & let them run. Ready the moisturizer and lip balm as well. Drink plenty of water too! 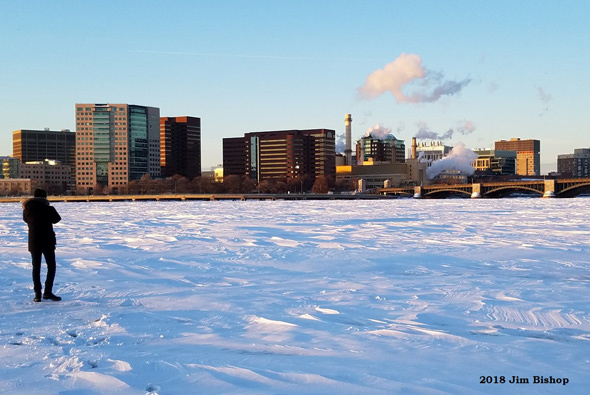 Gary Waldeck spotted the ice that had formed overnight by the mouth of the Charles River. Nicholas Agri spotted this sockless, sandal wearing person on the Blue Line headed towards Wonderland this evening. No word if the person was also holding a Dunkin' Donuts iced coffee. Gracie's in Union Square spoke for many this morning: Read more. Cold & wet conditions taking a toll on runners in #Wellesley, several runners being treated for cold related injuries throughout town. 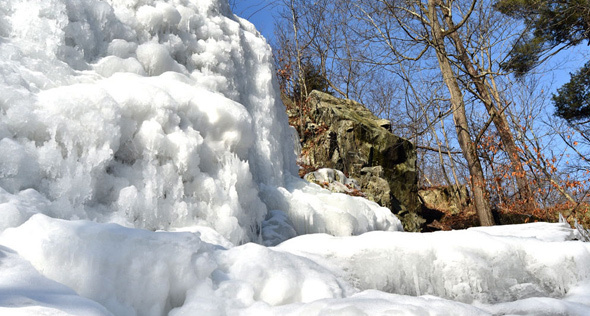 Greg Cook takes a walk to the still frozen Cascade falls in Melrose - and provides directions for how to get there from Oak Grove station on the Orange Line. 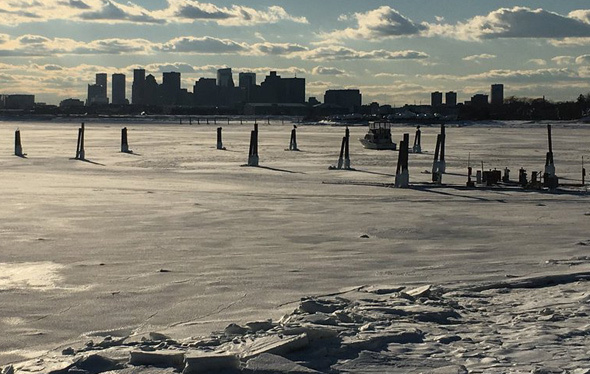 Rebecca went for a walk along Boston Harbor in East Boston today. 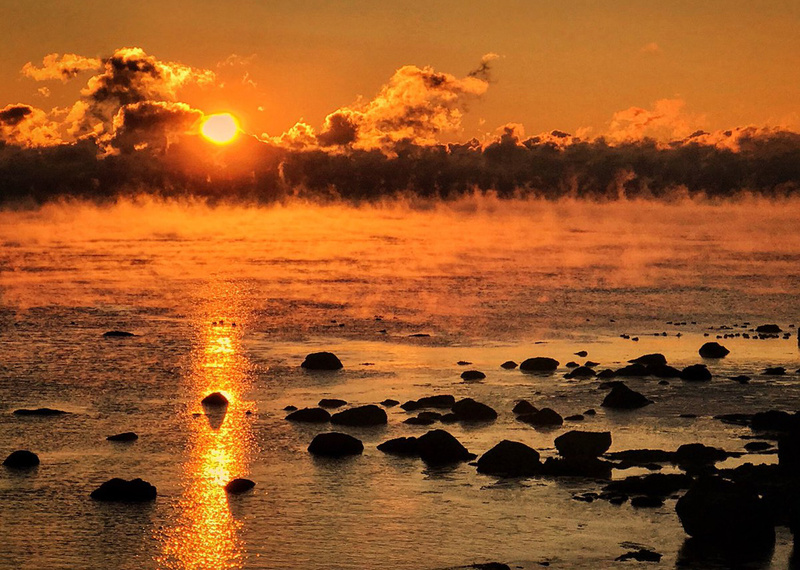 Compare to Redsox223's photo of Cape Cod Bay from Eastham a couple days ago. 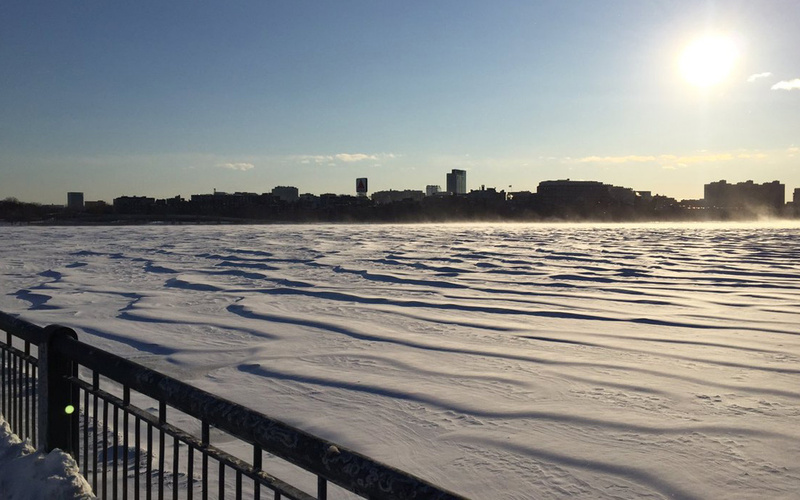 Jim Bishop admits he found it surreal to see a man standing on the Charles River today. 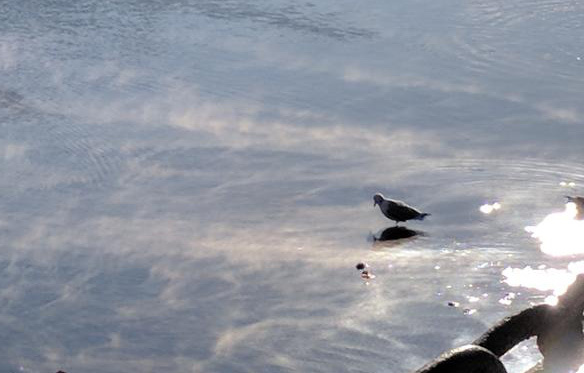 Kelley Hand braved the single-digit temps at Christoper Columbus Park this morning and got to watch seagulls in the sea smoke in Boston Harbor. Jocelyn also scanned the sea smoke on the harbor. The tank. Photo by BFD. 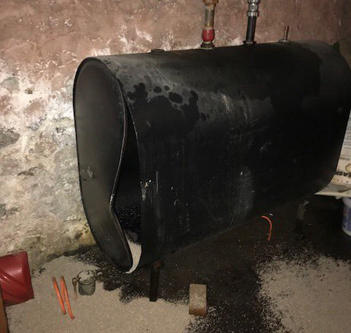 The Boston Fire Department reports an oil tank being refilled in a two-story home at 16 Tennis Rd burst this afternoon, sending roughly 170 gallons of the viscous liquid onto the floor. Read more. 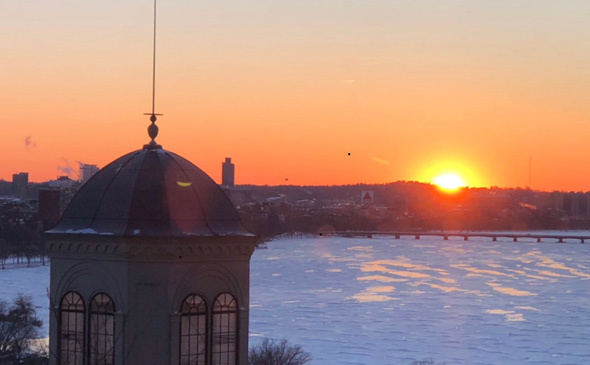 John Gage took a moment to watch the dying sun over the frozen Charles before getting up on his tauntaun for the ride home. Read more. 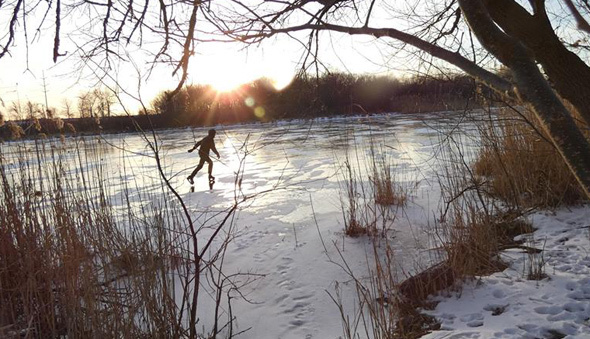 Mary Ellen spotted this skater on the Charles River at Millennium Park in West Roxbury a couple days ago. Authorities, of course, recommend not skating on the Charles. 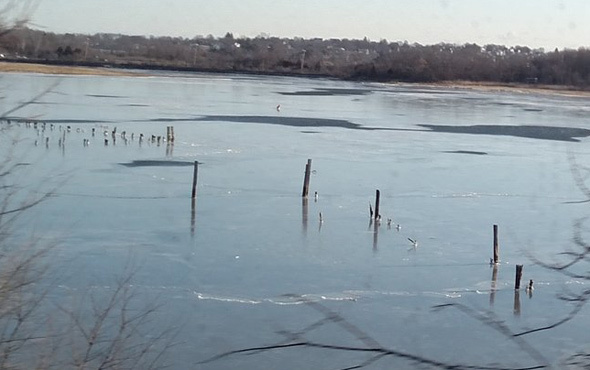 Ari Ofsevit gazed at the frozen wasteland between Cambridge and the Back Bay today. 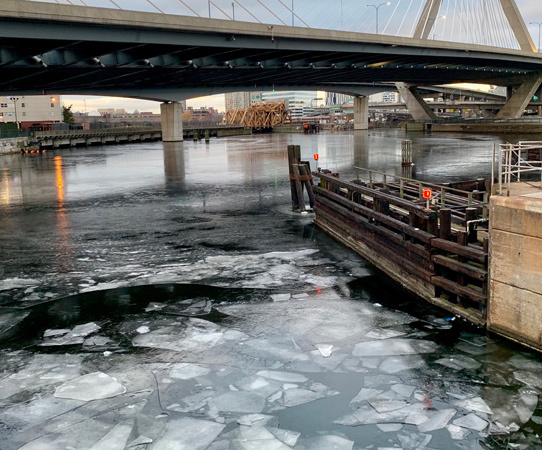 Casie Gillette shows us the real ice joining the iceberg statues in Fort Point Channel: Read more. Colleen O'Connor watched the waterfall at the Forest Hills T stop round 10 p.m.
Waterlogged lobby. Photo by Sara Bourne. 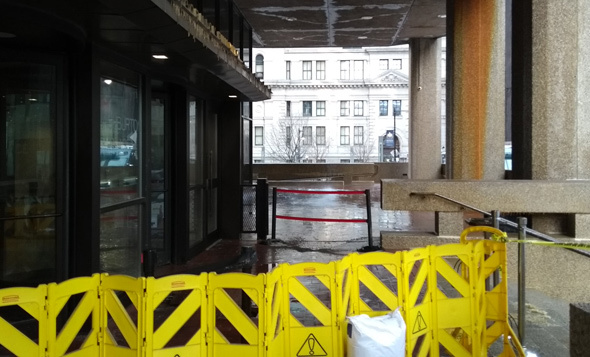 Around 1:20 p.m., Julia C. wondered why there was "water pouring out all the windows" of the McCormack state office building on Beacon Hill. The Globe reports the leak, apparently from a burst pipe, is "massive." 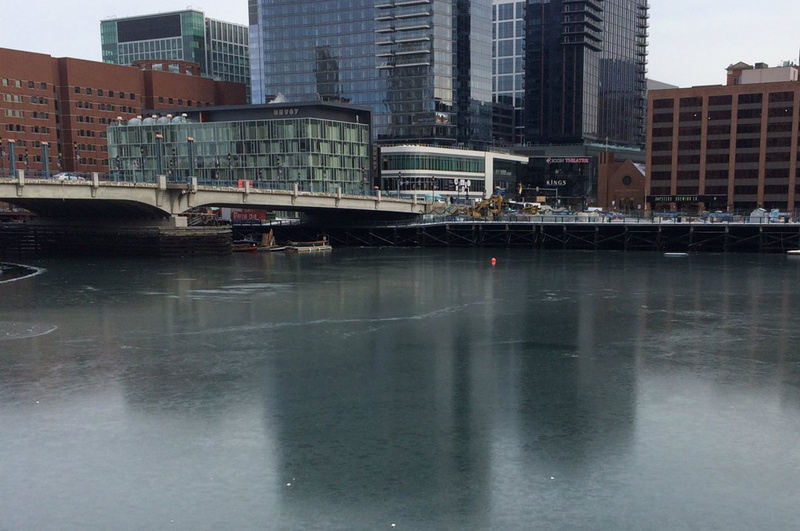 Adam Castiglioni reports Fort Point Channel is freezing up. Grizzled WBZ NewsRadio reporter Carl Stevens cracks an egg on pavement in single-digit temps to see what would happen. Looks like not all the water fountains in Boston got turned off before the first freeze, based on reports filed with the city 311 system over the past couple of days. Read more.